Lets get ready to the Rumble..as the saying goes for boxing afficionados! !The time has come where every Filipino,if I am not mistaken have stopped their work and watch the Dream Match of Manny "Pacman" Pacquiao. 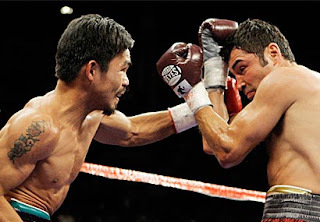 vs.Oscar "the Golden Boy"dela Hoya.The fight started with Manny Pacquiao outscoring the Golden Boy from 1st round until the fight stop at end of 8th round.Beginning at the 4th round Golden Boy face was swelling with his left eye that almost closed,receiving 1,2,3 or even 4 combination from Manny Pacquiao.The fight is a one sided,with Manny Pacquiao showing tremendous and terrific combination to dethrone the Golden Boy in his most lopsided loss boxing career.Congratulations to our Pambansang Kamao,Manny "Pacman"Pacquiao.You are not only a talented boxer,but also a legend in the history of boxing,The Filipinos all over the world are very proud of you..Mabuhay ka! !